You are browsing the Blog for e-learning. Just got news about this years courses by the Free Technology Academy, which is a partner of http://www.ict-innovation.fossfa.net. See the following announcement: The Free Technology Academy expects to run two course modules for users and systems administrators who want to get started with GNU/Linux systems. Skills in this area are increasingly demanded and hard to find for employers , making these topics very interesting for any IT professional. InWEnt/it@ab releases a series of advanced e-learning courses on Information Technology (IT)- “Open Source & More IT for African Business” focussing on the needs of business related IT consultancy in Africa. The courses introduce relevant and adapted key concepts and applications such as E-Business Applications & Architecture / IT Security / Open Source IT (including lessons on Ubuntu Linux Installation, Multimedia, Web Server, Groupware, Network Printing) / Web Publishing / E-Learning as well as /Zope & the Collaborative Learning Environment CLE2. In the spirit of sharing and mutual capacity-building, this series of e-learning courses is released under a Creative Commons Attribution-Share Alike licence. We are therefore looking forward to seeing further distribution, remixing and updating of the courses that make up “Open Source & more IT for African Business”. The editing team included Benjamin Coester, Petra Hagemann, Balthas Seibold, Christiane Weber, and Kerstin Nolte . Test your IT-knowledge! Check the courses online (Update: since 2011 hosted on GIZ’s E-Academy). 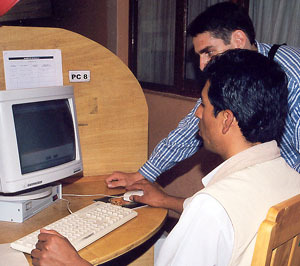 Which kind of e-learning technology for development cooperation? This question led the discussions at a roundtable of the International LEARNTEC Forum on 13 February 2007 organized by the “German network of e-learning providers D-ELAN” and Learntec, a leading German trade fair for educational and information technology. Balthas Seibold was on the panel with Arndt Bubenzer, common sense, Beate Dippmar, GTZ, Christina Neuhoff, time4you GmbH and Thea Payome, CHECKpoint eLearning (moderator) on: “Open Source or proprietary software: Where is e-learning heading within in German Development Cooperation?”. More on the roundtable is online at the site of Learntec (partly in German) (UPDATE – Link is not to latest version of the site on Internet Archive). What are the main needs, uses and expectations of internet users in Peru as an example of a developing country? This has been the main focus of a piece of research by Balthas Seibold, which resulted in two sets of publications: An article on the needs with the German title “Verfügbar, verständlich und relevant – was Nutzer in Entwicklungsländern von Onlineinhalten erwarten” and a set of case studies on main types of uses and content in high demand in Peru, titled: “e-learning & e-rotik – Welche Online-Inhalte fragen Internet-Nutzer in Peru nach? “.